incredible quality gallery! big Vote! Exceptional gallery. You live in a very beautiful city. You are a master of the night lights and I am admiring of the excellent images which you realize. Congratulations, Tomasz ! BV. exquisite night life .keep up the good work. Your world could not be more different than mine...but extremely interesting! You've captured it superbly!! Excellent gallery! Magnificent night photos and excellent compositions! I had a wonderful trip to visit Poland about 10 years ago. I would like to go back again. Excellent Gallery, captured the light well. A very well put together gallery of night scenes from Warsaw Tomasz. Terrific work.BV! A beautiful gallery to showcase Warsaw. Wonderful night photography, Tomasz! What a wonderful gallery. Lovely colors, light & mood. all are a masterpiece Tomasz. drugi raz nie dalo sie zaglosowac. Old and modern night`s Warsaw seen by sharp eye of great photographer! I love every single shot. Beautiful work and a fantastic tribute to a fine city. Vote! Fantastic high level Nightphotography Tomasz, amazing light and city scenes!!! a pleasure to browse this beauty again and again. A very beautiful gallery. Great feeling and mood here, as if the warmth of the city has come into your camera lens. Very well done. I love looking at night photographs. This one has a lot of variety, and you captured each one well. Very good night photos of Varsovia. Happy 2009! Better than taking a walking tour. Thanks for sharing the city! Photography at it's best!! Excellent gallery, as always. Lovely pics Tomasz, shows off the lovely old architecture and the modern to their best. You should show these to your tourism office, they sell Warsaw very well. Appreciate it more as I do lots of night photography too. :-) Good work ! Jon, UK. Superb gallery, enjoyed it very much. Vote. Strong gallery filled with incredible night shots of Warsaw. Bravo! It's kind of funny, how night pictures get to be the ones with nicer colors, isn't it? Beautiful night gallery...terrific exposures and colors! Words seem inadequate to express the beauty of this gallery and the talent shown here! Huge vote!! Really good, the colours and lights are excellant. Impressive collection of night shots, Tomasz!!!!! Big vote!! Very impressive gallery,Thanks for sharing such beautiful photos.GMV. a fantastic town and a wonderful collection of fantastic photos. Outstanding gallery with very high artistic value and close to technical perfection. Love it! I'm in awe before this wonderful nocturnal gallery ! on night photography ! Tomasz you are an Expert! Bravo ! The amazing gallery brought back wonderful memories of my Warsaw visit. Thank you. Big vote for this wonderful galley, Tomasz! nice city! well done! vote! wonderful work and a beautiful city in your eyes. Wow! Excellent night scene capture ! Big Vote ! Wounderful images here, excellent work! I love night captures, and these are some of the best I've seen! BIG VOTE! I like so many of these shots Tomasz. Warsaw has a lot to offer. Beautiful gallery! Excellent night shots. I love your treatment of darkness and light and the contrasts and reflections produced on the wet pavements. Well done! These new old town images you posted lately draw my attention to this wonderful gallery. Great work with night shots Tomazs. Beautiful colors, excellent compositions. Vote. I love the perspective on this one, you also catch the reflections, and light, great tonality. 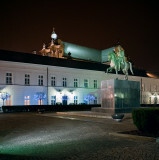 Excellent gallery Tomasz , beautiful photographs of Warsaw at Night. Warszawa nigdy nie robila na mnie wrazenia, wrecz uwazalem ze jest brzydka,..
az do tego momentu, v.
Very pretty gallery. Warsaw looks to be a beautiful place at night. Amazing view on night-time Warsaw. The city looks fabulous. Terrific photos of the highest quality. GMV.